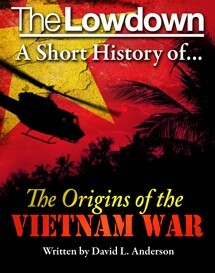 A concise history of the origins of The Vietnam War for a new generation. Dr David Anderson, Professor of History at California State University, Monterey Bay, examines the events that led to one of the most controversial wars the US has ever known and succinctly explains, for a new generation, why this conflict still matters today. Dr. David L. Anderson is Professor of History at California State University, Monterey Bay. He was Dean of the College of University Studies and Programs at CSUMB from 2004 to 2007. Previously he was Professor of History and Dean of the College of Arts and Sciences at the University of Indianapolis, where he taught from 1981 to 2004. A specialist in the history of U.S. relations with East and Southeast Asia, he is a past president of the Society for Historians of American Foreign Relations (SHAFR). He has served on the editorial boards of Diplomatic History and the Vietnam Documentation Project of the National Security Archive. He is general editor of the book series, “Vietnam: America in the War Years,” published by Rowman and Littlefield. He is the author or editor of ten books on Vietnam.